JSC’s own Stearns Performance Space hosted the musical talents of both Eli Smith and the Four O’Clock Flowers on Thurs., Nov. 13. New York City resident Eli Smith is a banjo player, songwriter and strong advocate for traditional folk music. Smith runs his own radio show, Down Home Radio, on which he interviews prominent acoustic artists such as Del McCoury, Bela Fleck and David Grisman. Smith’s folk band, The Down Hill Strugglers, were recently featured in the movie “Inside Llewyn Davis,” written and directed by the Coen Brothers and produced by T-Bone Burnett. The movie depicts the life of a singer-songwriter in Greenwhich Village in the 1960s. The Four O’Clock Flowers are a relatively new duo. They met in Brooklyn. Ernie Vega plays harmonica and many different string instruments, ranging from fiddle to guitar. Vega’s ability to play multiple instruments and carry solos himself provide the ultimate barebone musical backing for Samoa Wilson’s heavenly vocals. 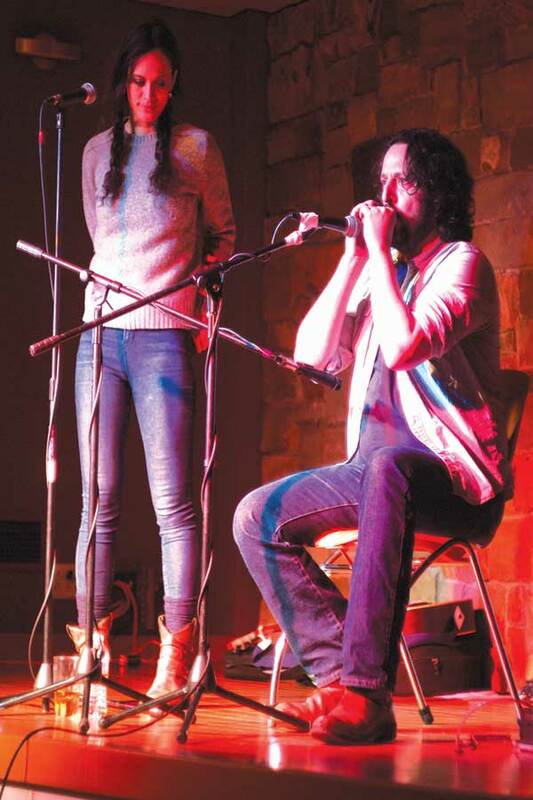 The concert in Stearns consisted of four five-song sets, alternately played by the Four O’Clock Flowers and Smith. The night came to an end with all three musicians onstage to play two songs together. Smith opened with a guitar instrumental and transitioned into an old- time banjo tune entitled “Wild Bill Jones.” Smith stayed true to his traditional interests throughout his sets. His banjo and guitar paired well with his voice in songs such as “Lonesome Road” and “Cookoo Bird” by Doc Bogs. The Four O’Clock Flowers brought a level of entertainment to the stage that seemed unrivaled by Smith. Vega’s unmatched ability to switch his instruments between songs added immensely to the show’s entertainment. His 12-string guitar filled the room with sound as Wilson’s voice led the audience on the journey of her melody. When the Four O’Clock Flowers and Eli Smith joined each other onstage, Smith drew his mandolin while Vega kept his guitar in hand. Even though the three are not officially a band, it was apparent that they often play together. When I had the opportunity to speak with the performers after the show, Smith told me that Vega and he play together at the Jalopy Theater in Brooklyn, where Wilson and Vega met. The following night, Eli Smith and the Four O’Clock flowers performed in Burlington at Radio Bean, ending their three-day weekend tour of northern Vermont.